DARREN Clarke’s personal investment in the Irish Open paid off in some style at Royal Portrush. The Open Champion brushed off any suggestions that he went ‘beyond the call of duty’ to help bring the event to the North Coast but his influence was undeniable. 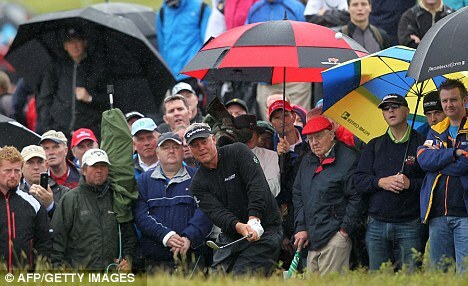 Clarke has long championed the cause of Royal Portrush. His powerful advocacy and Open victory at Royal St George’s last year helped seal the deal following as it did, in the wake of Rory McIlroy and Graeme McDowell’s major wins. “I just tried to help as best I could. I haven’t done an awful lot. It’s the members of Royal Portrush, The European Tour, all of the volunteers that have done all the hard work,” said Darren after signing for a final round 71 that saw him finish the tournament on four under par and in a share of 39th place. “It was a very special occasion for the Irish Open to come to Royal Portrush. It’s been such a long time since it’s been up here and I just tried to help them in whatever little way I could. “It’s been absolutely brilliant. Obviously I would have liked to have scored a little bit better than I have done. But overall I think the event has been enjoyed not just by the professionals but by the spectators and everybody involved. Clarke made his first cut of the season at Royal Portrush on his return to action following an enforced month off to rest a groin injury. He will play in the French Open this week and then skip the Scottish Open as he builds up to the defence of his Open title at Royal Lytham and St Annes. “It’s been one of those weeks where I’ve hit too many sloppy shots and paid the penalty for it, but overall I’m pleased with where my game is at,” he added. This entry was posted on July 2, 2012 at 11:40 pm and is filed under Golf. You can follow any responses to this entry through the RSS 2.0 feed. You can leave a response, or trackback from your own site.